Timesheet software with time recording, categorized reporting, pop-up reminders, billing code, and personalized calendar features. 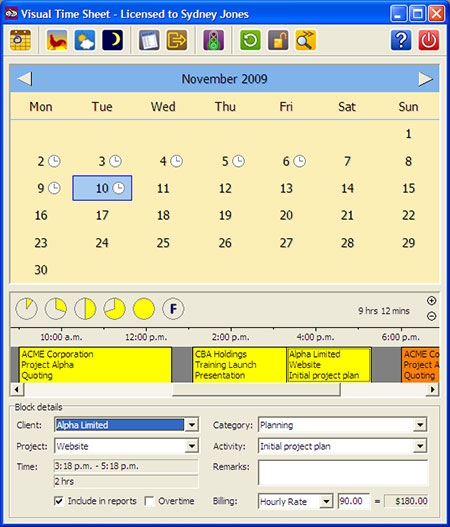 Comments: I have been using visual time sheet for several years now. It is very easy to use and essential to me in my small business. It is not web-based, but as I work from a Windows laptop, that's not an issue. Common clients and projects are visible across our small workgroup. Standard reports are simple, but a flexible data export option is available if I need to do more detailed analysis. All in all, this software keeps it simple, which really encourages use. That's the most important thing to getting accurate time recording.